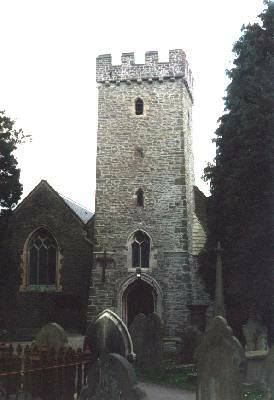 The Parish Church of St.Catwg stands on the site of the oratory which was set up by St.Catwg in the Sixth Century. The Roman road leading North, Sarn Helen, must have passed close by but no trace of it has been found. The Parish covers the whole of the West bank of the Neath river. This view from the South was taken in the summer of 1998. 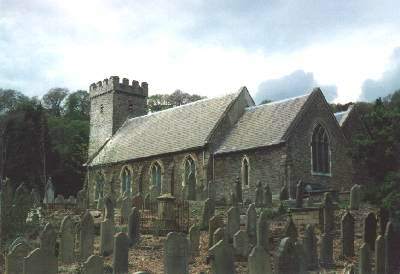 The Graveyard was enlarged in 1848 when it was also enclosed. A further enlargement took place in 1876. In the summer of 1998 clearance work is continuing and I have located the graves of three generations of OWEN ancestors in the older part to the South of the Church, close to the wall near the current Funeral Home. They were a Neath Abbey family, my g.g.grandfather David Owen (1808-1881) being a Master Mason with the Neath Abbey Ironworks. His gravestone looks as if it has been reused, as the back of the headstone refers to a John Jenkin; David`s wife was a Margaret Jenkin. His father William is buried in the next row West and his father, another David, about 3m away towards the Church. William was a founder member of the Calvanistic Methodists in Neath Abbey and David was a Deacon. It is interesting that they were still buried in the Parish Church where they were both baptised.